So we are now well into our fourth full day of being on our first trip with Jacob. Unlike most of our other journeys, being that we’re…you know…literally carrying a little micro guy with us who isn’t exactly fit for endless car rides or traversing Mordorian volcanoes, we decided that on this journey we would take it easy. Just seeing palm trees makes me feel relaxed. After embarking from JFK airport, we landed in Montego Bay, Jamaica. From there, we were taken via shuttle to our base of operations, the Franklyn D Resort. No, that’s not a misspelling and no this place has nothing to do with the longest serving US president. It’s just a resort founded by a guy named Franklyn D. Rance. 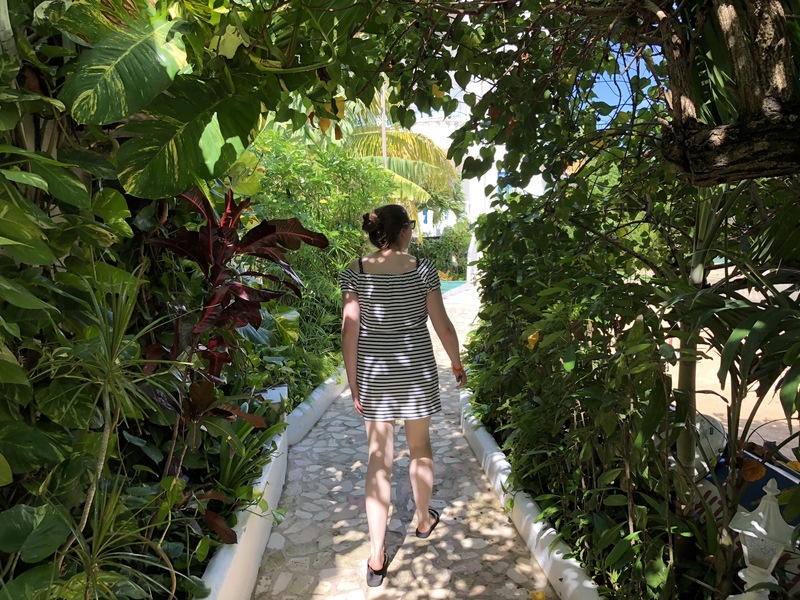 So far we’re really happy because aside from just being a lovely place to relax in the Caribbean…each room comes equipped with a private nanny! 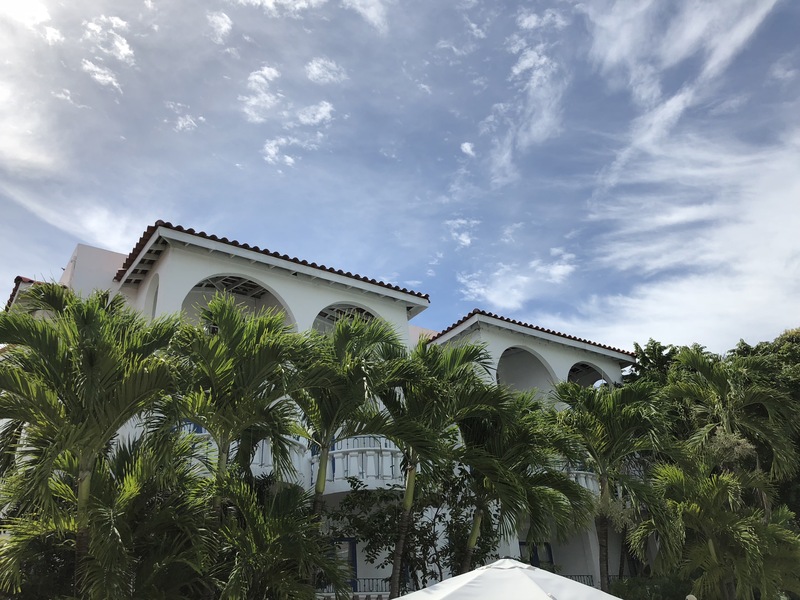 That’s right, aside from being an all-inclusive resort with the standard trappings (food, drinks, most activities, alcohol) we chose this place because for about 8 hours a day (plus for about $12 an hour at night) you can leave your kid with a nanny. And it’s really not THAT much more expensive than other all-inclusive options that DON’T come with a a free babysitter willing to give bottles and change diapers and all the rest of it. Now don’t get me wrong, leaving our baby alone with a stranger is not something we were in such a huge rush to do, but this place had stellar reviews on Tripadvisor and elsewhere so we figured it had to be safe. So we packed up the baby monitor, noise machine, a bunch of toys and some swimwear for both us and the little man and set off. This is really a very different tone from our other trips though. It’s more of a vacation than an adventure. 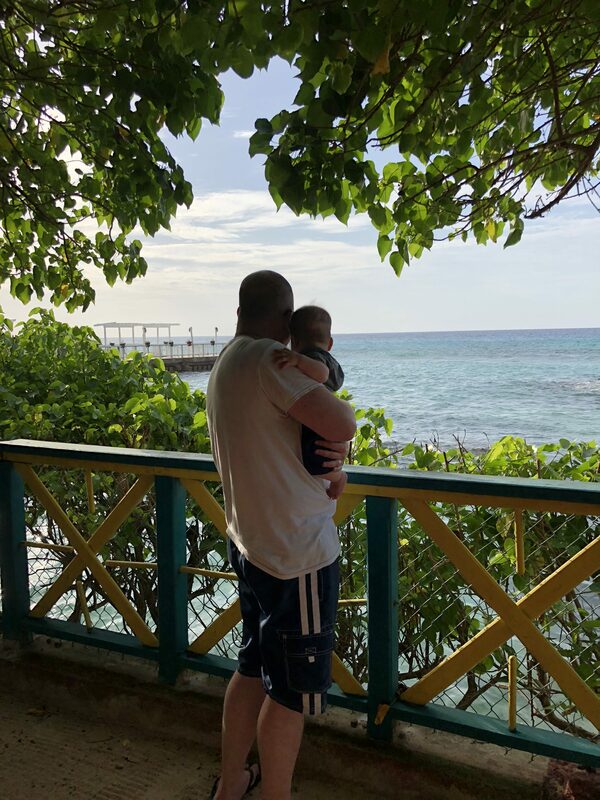 Jacob’s first view of the open sea. Because as much as we like and trust Sashanna, our nanny, the thought of leaving Jacob behind for a day of adventuring in a foreign country doesn’t rank high on our list of risks to take. Exploring the grounds of the Franklyn D. Resort. 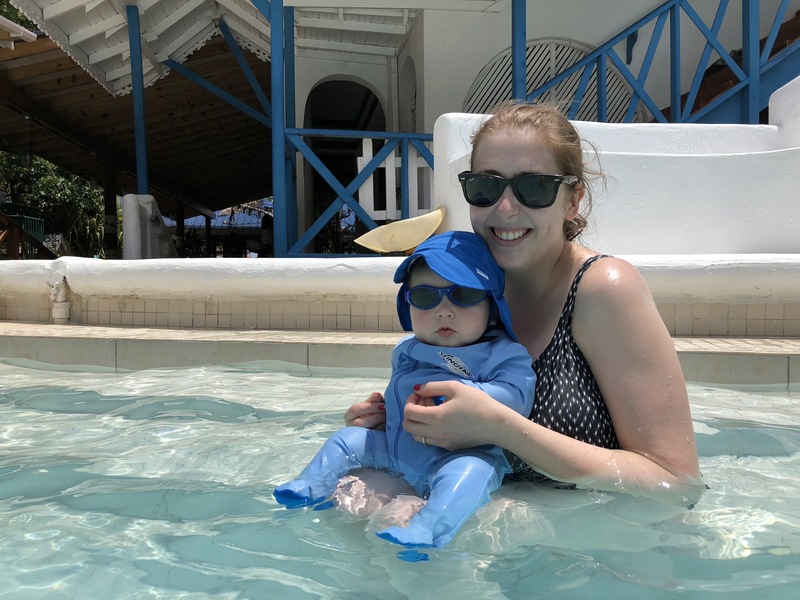 We’ll be back someday to check out Bob Marley’s birthplace and/or the Blue Mountains, but for now – especially after 4+ months of handling a newborn – we were content to just relax on the beach or poolside. To be sure, having such a little baby means that even here in paradise we’re not totally able to unwind. Having a nanny is great, but we’re still parents, which means we can’t help but spend a lot of time with him even when he’s with the nanny. And even when we’re sitting out on our little porch overlooking the water, we’re there with the baby monitor. And once he’s down for the night, we’re able to go to the resort’s restaurants and enjoy a date night every night. That’s pretty great. And definitely the most relaxed we’ve been since he’s been born. And it’s also great to expose him to new things, even at such a young age. Culturally, New Jersey and Jamaica are…….pretttttty far apart from each other. And the sounds and images Jacob is seeing are very very different than what he’s used to. Back home, we discovered recently that he really likes being outside and looking and plants and trees. Well here he’s seeing plants and trees that couldn’t be more different than what he’s used to. Finally, we are planning to do as much traveling with him (and his potential future brother or sister someday) as we can. So it only makes sense to get him exposed to things like airports, airplanes and bus rides as early as we were able to. Plus if he is used to being outside of his comfort zone now, hopefully it will be easier when he is older. Like getting him used to sleeping in places other than his room feels like something that will come in handy. Even if we had to endure a mini-re-sleep-training on the first night here (which really sucked), having him able to sleep in a strange crib in a strange room in a strange house in a strange country makes it all worth it. Getting him used to be around strangers will hopefully make for an easier transition into daycare once Ariel goes back to work. And I’m proud to say that I have now managed to change a diaper in the sky. 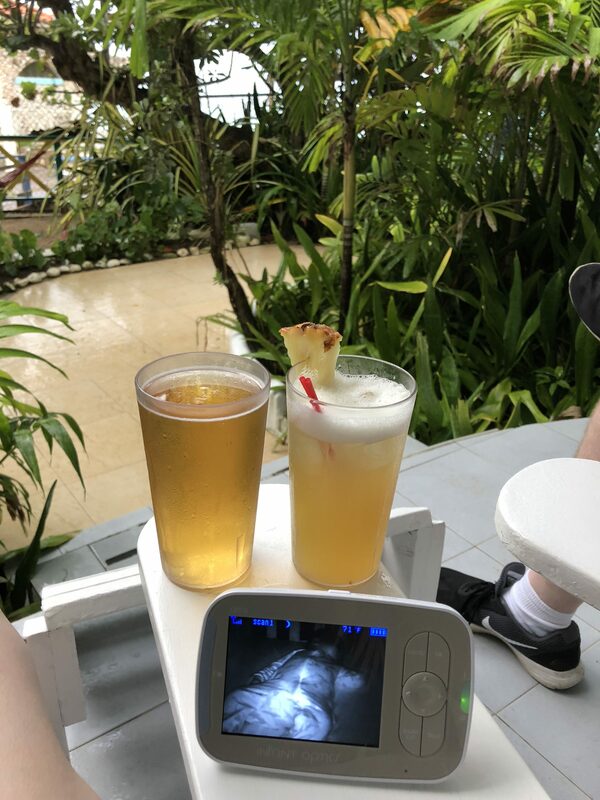 So even though we’re here on a resort, just the mere fact we are traveling with a little baby makes what would be an otherwise relaxing time a bit of an adventure.